Want these books and goodies before I donate them? Half of them will be going to our local thrift store here, but wanted to see if some of them you guys would like as they’re pretty on target with what we talk about here… So if you’re interested in any of them (and they won’t clutter up YOUR life! ), let me know via email or in the comments below and we’ll randomly select a winner for each after the weekend’s over. Picked up this book on a beach vacation a couple of years ago, and it was super interesting… Might have seen me mention it in our post on extreme couponing earlier this year too. 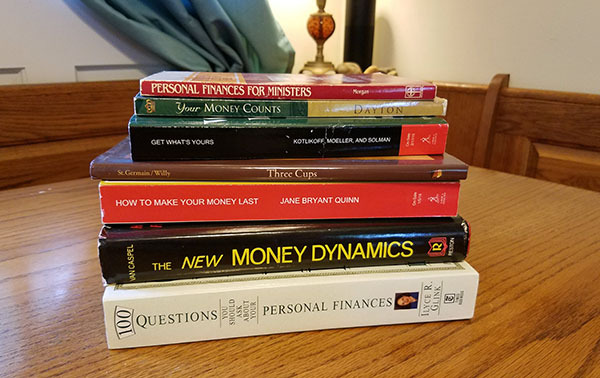 Giveaway #4: Package of Old School Money Books! Giveaway #5: Package of Daily Planners/Trackers! 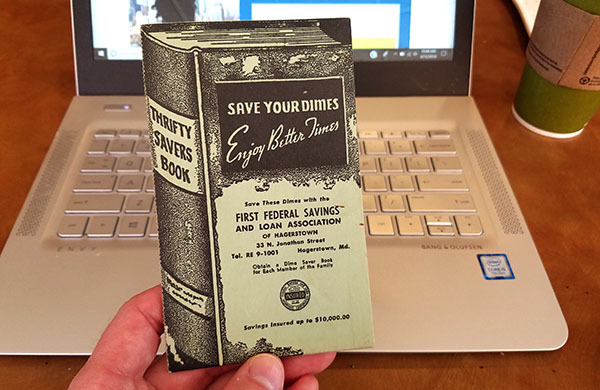 Lastly, our dime saver book circa the 1950’s that we blogged about earlier in the year: Save Your Dimes, Enjoy Better Times! I picked it up simply to share it here, so if you or someone you know can cherish it forever, please do take it off my hands! Perhaps you want to challenge yourself to filling up all 30 holes and become $3.00 richer? ;) All the cool kids are doing it!! If you want any of these -AND- you’ll use them!, drop me a note below with *which one* you want by Monday morning, and I’ll add your name into the randomized drawing. 1 entry per person, and U.S. addresses only please (shipping is hefty internationally, sorry). 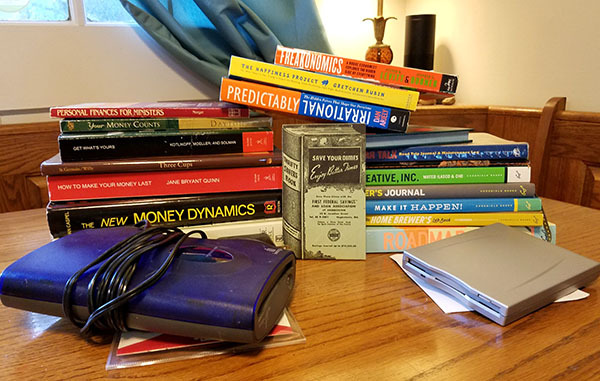 Package of Old School Money Books — Rita H.
Zip Disk Reader — Chris P.
Floppy Disk Reader — Sheryl C.
Dime Saver Book — Heather C. Yes!!! Would LOVEEEEEEEEE package #4!!! Thaaaank youuuuu!! I really enjoy reading your emails! Really gets me focused. I would really like to he entered for the Package of Daily Planners/Trackers! Thanks for doing this. I am interested in the books! I read everything I get my hands on! If I only get to pick one though, I’d like to pick the happiness project. Have a great weekend. Great read! 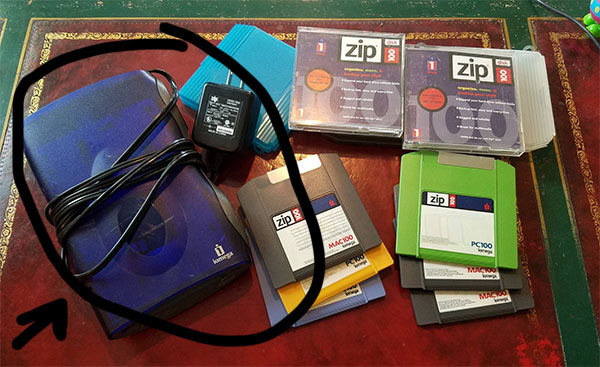 Please enter me for package 6 as I have 15 or so zip backup disks with kid pics that I would love to see again! I would love to have the daily planners! Planners help me stay focused. I would love a copy of Predictably Irrational! Thanks for all you do. Love starting my day with your wit and thoughts. Giveaway #4 would be awesome! Thanks so much for all that you do. Sweet giveaways. I’d love Giveaway Package #5 – planners. I can certainly use the productivity workbook and have perfect recipients for all the rest. I would like to enter Giveaway #3! I want to read that ‘Predictably Irrational’ book! Sign me up for predictably irrational please! Sounds very interesting! I would love giveaway #2, my son is always reading about the inner workings of things, I know he, and I, would really enjoy this book! Thanks for always getting my money wheels turning early in the morning, keep up the great work, I appreciate you!! Thank you so much!!! I appreciate YOU! Please throw my name in the hat for Giveaway #3. 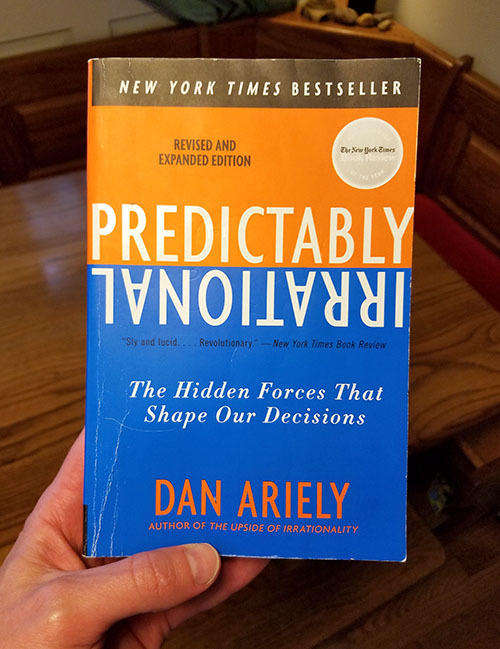 #1 Predictably Irrational – I’ve been meaning to read it but haven’t yet. (I guess I was procrastinating? LOL) Also, I’ve been on the lookout for books I can add to the “family book club” I’m starting next week and this would be a good one to throw in the rotation to give the kids some extra learnin’. I have been reading your posts for about a year and I love all the interesting and fun information you throw out along with your money info. I provide free financial education classes as part of my job at a non profit. I am alwsys building up my library. I tell my clients I will read the books and summarize all the good stuff for them. 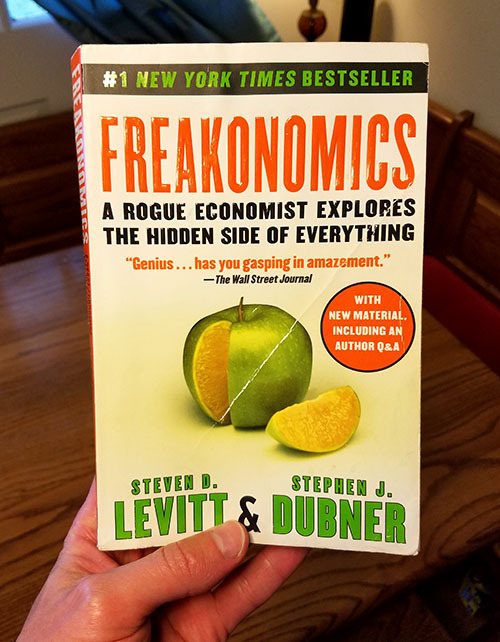 I would love the copy of Freakonomics. I think the tidbits would be great facts to toss into my classes. #8 for me please! I actually have a lot of the books you’re giving away (makes me think I should do my own purge) I love the Dime Book. Maybe you could do a “book party” with all your friends and throw them all in the middle and then people can pick up new ones to read for themselves and all books left on the floor get donated afterwards! Triple win! #2 – Always love reading about thought processes that differ from my own. 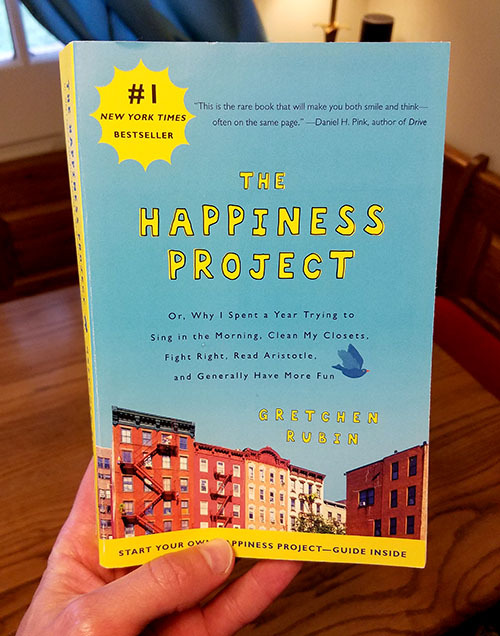 #3 Happiness Project…I would like to read this book for myself after reading so much about it and following Gretchen Rubin’s blog. I would really really like Car Talk, thanks! Would love #2 for my son, he loves learning about the inner workings of things and organizations. Thank you for sharing all of your awesomeness with us, I look forward to your early morning emails. I’d like to enter Giveaway #3!! Been wanting to read this for a while. For some reason I think a hard copy would finally get my invested! Oh! 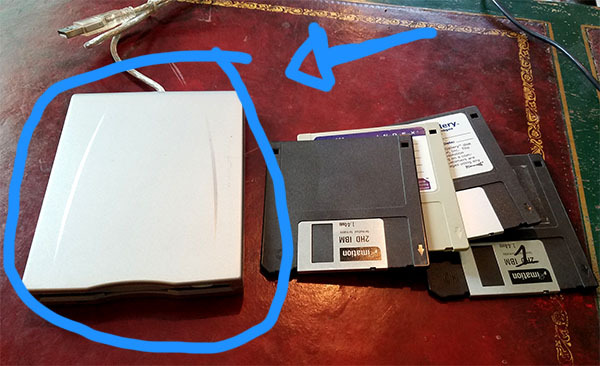 Me – I would love the Floppy Disc reader – I have a ton of those, and wanted to go through them one last time but my work computer got upgraded & I lost my disc drive. :( Oh no!!! I’m sitting on old pictures of my two boys, I’m sure – they’re 12 and 15 now, those discs probably have cute baby pictures I’ll never see again. Love your blog, thank you for educating me on personal finance! I also love your book recommendations – I get as many as possible from my library (I’m a librarian). I am so stuck on which package. Its between #2,#3 & #1. I believe in that order. Must be so systematic of me to make this harder than it needs to be but I guess with these great reads I can understand my inner workings and find happiness. Haha okay.. and fortunately you can find any of them at the library too!! I’ve been looking everywhere for a used floppy disk reader! I have a bunch of old documents on floppy disks and no way to transfer them to a cloud without buying a new one (which I only have one use for, and then would have to donate or toss, ugh). I would love The Happiness Project! That’s one I haven’t read yet. Thanks! Pick me… pick me… I have an american mailing address so you don’t have to ship to Israel. I am interested in the first one. That book has been on my want to read list for awhile. Would be an awesome start to get our newborn into saving! I would love to win Giveaway #8 ~ Dime Saver Book Circa 1950’s. I would cherish it forever. I do not know what it is about dimes but I just simply love saving them. I remember those little cards. My parents had some. It brings back so much memories. I use to play with them as a kid. I would be glad to take this little beauty off of your hands. Hi, can you please enter me into #3? I myself have been trying to figure out what makes me happy in the past year, what is important and cutting out what is not little by little. Difficult journey! Curious to read her book! It was a hard choice but I’d like to be entered to win #4 please! Well this is exciting! I am so thankful for your emails and blogs that have helped me tremendously in learning how to save and budget! I would love to be entered for package number 5. Hi – I would love to enter for package #4. As runner up choices (if you get tons of entries for #4) – I’d also be happy to read #1, or try #3 (no relation to Gretchen – but I’ve heard good things). Thank you so much for passing these things on! This is great! I’d love #3 as I’ve been meaning to read it but every time I get it through the library time is up before I get into it. Thanks! Good morning, I would like Giveaway #5: Package of Daily Planners/Trackers. 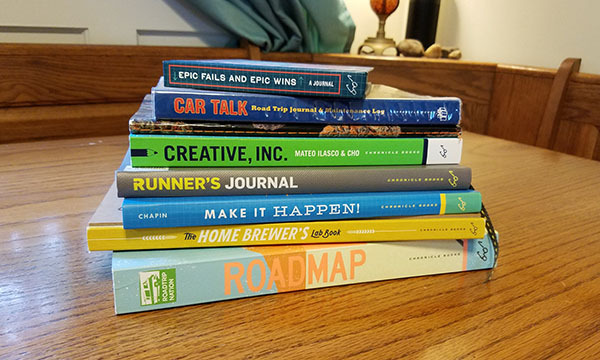 There are books for a few of my framily (friends and family) members to stay accountable to their personal goals and surprisingly enough, 2 of best friends have ventured recently into the cannabis industry and my brother in law is a beer aficionado. These would be fabulous gifts! Crossing my fingers. I’ve never heard of #3, but it sounds interesting. Mark it! I would like to be entered for the #1 package Predictably Irrational book….thanks! Get-yo-s#!t-together project! Obsessed with planners!!! Hey, J Money. Would love to be entered into Package #4. Thanks! I’m torn between # 4, The Happiness Project, and # 8, the Dime Saver. Hmmm…ok, hopefully I can get the Happiness Project at the library …. So my final choice is giveaway # 8! Please enter my name in the drawing for Giveaway #4: Package of Old School Money Books! Super interested in Giveaway #4: Package of Old School Money Books! I would really appreciate package number 4! Old school money books are the best because some long forgotten simple tips can still be extremely relevant today. Right now the goal is debt free but I’ll get there! I would love the Save Your Dimes, Enjoy Better Times!. It’s hard to choose between the first three but I think I’d have to go for #1 Predictably Irrational – sounds fascinating! I would love the package of old school money books. And if you want, if you have an extra copy, I would also love a copy of suze orman’s young, fabulous and broke. I hear it’s a good book. I’d be interested in #3. Great blog! I would love to enter Giveaway #3 The Happiness Project! I would love giveaway #5. I am a planner beast. I can promise I will use those babies well. Also, in a strange coincidence, I just finished rereading The Happiness Project this week. I can vouch for it being a great book with a wealth of ideas for anyone wanting to bring a little more happiness into their life. This is so nice! I am interested in Giveaway #5: Package of Daily Planners/Trackers. Thanks for the opportunity! Dude #4 or #8 would be AWESOME!!! You da man!! Giveaway #5 would be awesome. Thank you for this dope opportunity! Would love a chance at #5! Tuesday & Thursday commutes just are not as good without a new BudgetsAreSexy article. But that means Fridays are all the sweeter, especially when knowledge is literally being dropped (via “post.”) I’d like to enter #2 please! Been meaning to read Freakonomics for years! I used to blog every single day before having all my kids :) never missed a day for 5 years straight! I want to save 30 cents & then I will be rich! #4 because I want to see what what books #1-2 are about (though all the books look interesting). I don’t know why but I really want to see what personal finance for ministers is all about. #1 has been on my list of books to read so that would be my second choice. Some really nice reads but I’m still working through the coin books you graciously sent me. Just wanted to let you know that your giveaways go to good use. Floppy disk? Thought that is what’s giving me this chronic back ache! Oh good – glad you’re reading/enjoying them! Hope they help! Hi J money, I’m interested in The Happiness Project. Thanks for offering this to your readers! Put me down for Giveaway #5 por favor! I’m working on turning my calligraphy hobby int a business, so Creative Inc. is a must!! #6 ZIP Disk would be awesome! Giveaway #4!! I donated my copy of “Your Money Counts” and wish I’d kept it! Please enter me for the Dime Savers book. I have some of these still from my childhood (yep, they’re still filled lol) AND Hagerstown, MD is 10 minutes from meeeee! I’m interested if the giveaway is still open, love your site! Would love the travel #5. Previous post: Financial Stats Bomb! Next post: What I Learned Tracking My “Wants” For 30 Days!